The original cat self defense keychain. 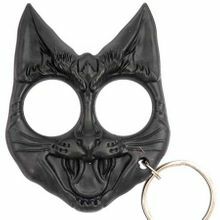 The wild cat keychain will make you more effective in your self defense. This is one bad kitty if you are on the wrong side of it. Easy force multiplier to make your strikes count. Compact, tough, easy to use. Features a detailed snarling kitty cat design. To use in a self defense situation, put your fingers into the eye holes, and the 1 inch ears become a spike impact weapon when gripped tightly and swung or punched at your attacker. You can jab its ears like a knife at vital areas or slash it at the bad guy's head and face. This kitty will make your punches hurt more. The indestructible poly-resin body makes it light weight and easy to carry around with you as a keychain. Length: 3 inch Width: 2.5 inch. Eye-holes for fingers are about a 13 ring size. This model is especially compact allowing you to use your fist or an open hand as you choose without losing it. Very convenient, easily fits into pocket or purse. New colors now available for the stabby wild cat knuckle keychain including, pink, white, green, blue, grey, purple(cld172), red (cld138) and orange. New, now we have a brass evil kitty, too. Very heavy duty, it weights 5 ounces and is the same size as its lightweight siblings. The brass version is restricted, same as the metal cat keychains, ie Restriction for brass cat keychain model only: Sorry folks living in FL, CA, NY, IL, TX or MA, we cannot ship this item to you. This arrived a week before it was said to arrive! Perfect condition and fits my hand comfortably.